The run up to V-Day has begun! We missed out on Rose Day. However, Propose Day isn’t all that bad to start our countdown of V-Day specials for you! A spoiler alert for those who are thinking about dinner date at a fancy restaurant or giving away a bouquet of red roses. No way, stop being so damn predictable! Here are some great Valentine’s Day tech gifts you can buy for that tech savvy special one! Wireless, effortless and simply magical! 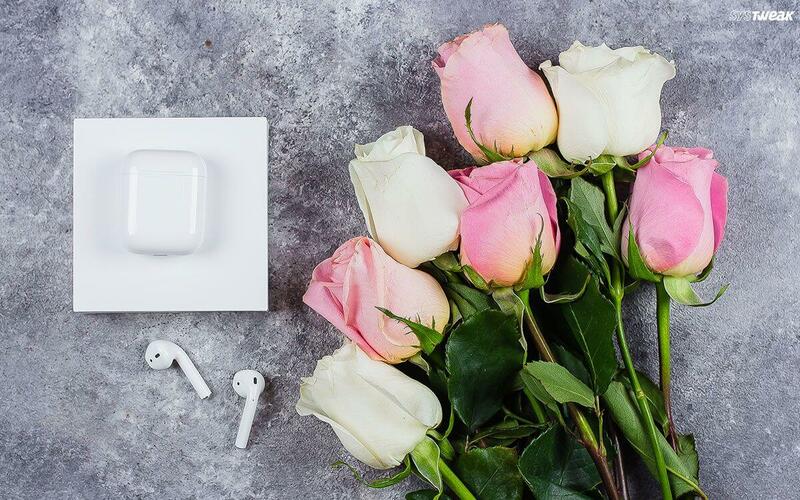 Gifting them a pair of Airpods is a fabulous idea. Just take them out and they’re ready to use with all your devices. Put them in your ears and they connect instantly. They sure will make listening to your favorite tracks together, better! Instant photos are nostalgic and fun. Let the camera do all the work for you while you enjoy spending a gala time with your loved one. All you have to do is find a frame to put the photo in to cherish these moments for a lifetime. Find the perfect audio companion for her workout sessions. These are among the highest-rated sport headphones you can buy — great for anyone who listens to music while exercising. With this stylish accessory, you can charge your compatible Galaxy smartphones, and other Qi-compatible devices, without the need to plug your device in to a wall charger or USB port. You can still use your device while charging, and your device is always accessible so you can answer a call without having to unplug. Stay close, stay connected! If your partner is a photography enthusiast, then they’ll surely love this gift. Plan a holiday, explore new destinations by taking a 360 camera along with you to add a 3D essence to your memories. These smart plugs will make your loved one’s life easier by remotely controlling home electronics with the simple use of an app. You simply need to connect the plugs to Wi-Fi networks and download mobile applications in a jiffy. A romantic evening is incomplete without a glass of wine! So save your loved one from the hassle of pesky corks and gift them an electric wine opener instead. If your valentine is a wine connoisseur, then they’ll surely fall in love with the sleek metal design. These Bluetooth-enabled lights feature built-in speakers that pair with your smartphone to play music, so you can set the mood in more ways than one. Become your partner’s favorite DJ and make your valentine’s day unforgettable. Don’t leave your selfies in your phone forever. Print them! So if your loved one is a fan of polaroid photography grab this gift right away to click unlimited handy snaps. With all the stuff we lug around all day every day—laptops, keys, chargers we often tend to forget where we kept it. So if your beloved has a forgetful nature, let this attractive wooden Bluetooth tag become a helpful guide to make their life easy. Hope you liked our romantic tech picks. Surprise your loved one with these special valentine tech gifts and unwrap a lifetime of happiness. Some gifts are big, some are small, but the gifts that come from the heart are biggest of all! Chocolate Day Special: Tech Gifts Ideas You Should Avoid This Valentine’s Day!